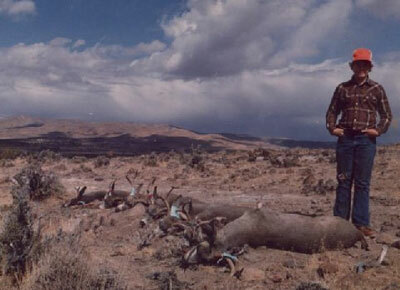 Rob Dellinger poses by the 1978 opening morning take of mule deer bucks in the X zone just east of Susanville, California. This is a picture of me on my first deer hunt in California. It was in 1978, and the picture was taken in Susanville. We were hunting on a ranch belonging to the Egan family, which was a private deer club then. The land has since become state property and is now part of a special draw in the Bass Hill area. The deer I am standing in front of was my first kill (4 point), and I shot him at about 150 yards with a .270. He was one of 9 or 10 bucks in a bachelor group, and he was the biggest so I took him. The other 6 bucks in the picture were mostly killed by kids my age. The picture was taken at about 8:30 a.m. The afternoon hunt provided another 5 bucks about the same size. I know this area still has some pretty good hunting, but I don't think it's half as good as it was then. Nothing like good hunting memories. That's one of the best parts of hunting.